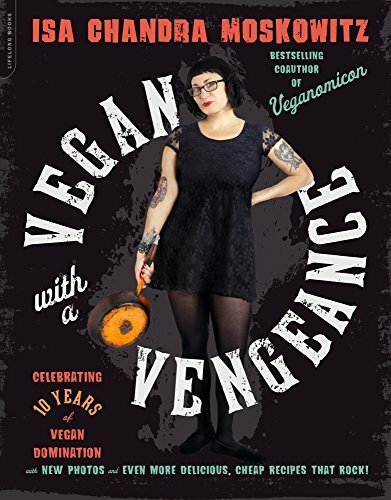 Vegan with a Vengeance By Isa Chandra Moskowitz. I adore Isa Chandra Moskowitz and have many go-to recipes in Vegan with a Vengeance including: Punk Rock Chickpea Gravy [my mom loves this as well]; Corn Chowder; Classic Pesto; Basil Tofu Ricotta [perfect for lasagna] and Seitan. I actually just made Seitan this week and I’ve been vegan for eight years and vegetarian for decades prior. This recipe for seitan is delicious and super easy. I made several delicious stir-frys and will get 4-6 meals out of one batch. In 2014, Moskowitz opened Modern Love, a restaurant in Omaha, Nebraska, where she serves up seasonal menus of “swanky vegan comfort food.” Her Post Punk Kitchen blog is an outstanding source for recipes and tips. When cooking I often refer to her Appetite for Reduction and Veganimicon [co-written with Terri Hope Romero] which many consider the vegan bible. It’s a must-own for any vegan. This is the 10th anniversary addition. There are additional recipes including: Black Bean & Quinoa Soup; Chickpea & Rice Soup with a Little Kale; Lentil-Walnut Burgers; Olive Oil Double Crust; Ginger Peach Pea; Asian Tofu and Call Me Blondies. I will definitely try those soups. A vegan must. The index is much improved. Items organized by both recipe name and ingredient. Moskowitz includes her “The Post Punk Pantry” which gives you suggestions for the spices seasons and other vegan essentials like dried beans, grains, canned foods you should always have on hand for simple cooking. She also suggests knifes, pans, appliances to make your cooking and baking simpler in “Tools and Kitchen Stuff.” Vegan cooking and baking shouldn’t be difficult. It needs to be nutritious and delicious. Right? I’m not much of a vegan baker but she has some delicious baked goods items. There are better pictures, easier directions and streamlined ingredients. I’m as much a one-pot cook as I can be and when you have limited space for cooking as many of us do, that’s key. Sections: brunch; muffins and scones; soups; little meals, finger foods, and sammiches; sides; pizzas and pastas; entrees; cookies and bars; desserts. This entry was posted on July 17, 2015, 17:44 and is filed under Books, vegan/ vegetarian. You can follow any responses to this entry through RSS 2.0. Both comments and pings are currently closed.